Todays post is kicking off some Autumn Winter style tand I'm thrilled to be covering a trend tackler with one of my favourite brands too! Primark asked me to go into store and pick out my personal favourite trouser looks for AW18. 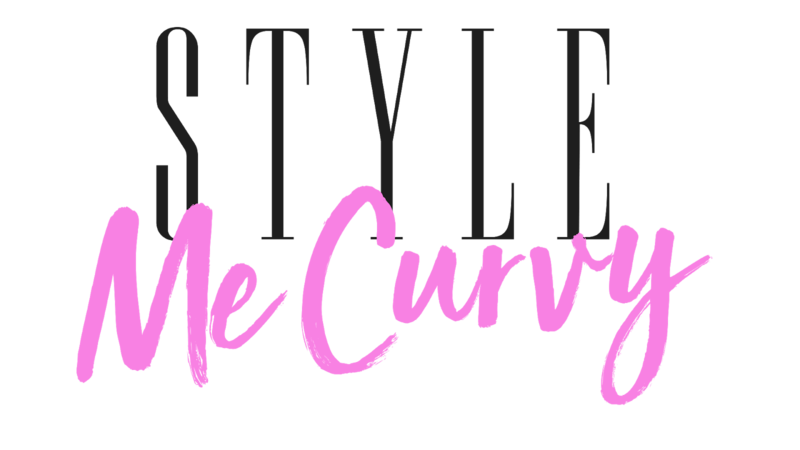 It was hard to narrow it down but I decided on three totally different styles and cuts that would work for all tastebuds, lifestyle options from the casual to the formal, and of course styles that would work across all body types. All items today are new in and range from sizes 6-22 ( and 24 in some items too). Look one is very much a city chic outfit which can be worn with flats or heels easily. Rusts and amber tones are a huge colour trend for Autumn Winter and I loved how this particular style has an added belt option. The trousers are tailored but still have a slight relaxed feel to them if you are the type of person who doesn't like trousers to be overly fitted on the leg area, then this style is ideal! It's a smart look that's perfect if have a number of things planned in the one day from meetings to lunch with friends or simply an easy day to night style. You can restyle this easily with a simple white top or statement t-shirt for a more paired back look, or opt for a black blazer and a black silk cami top for smart formal feel. 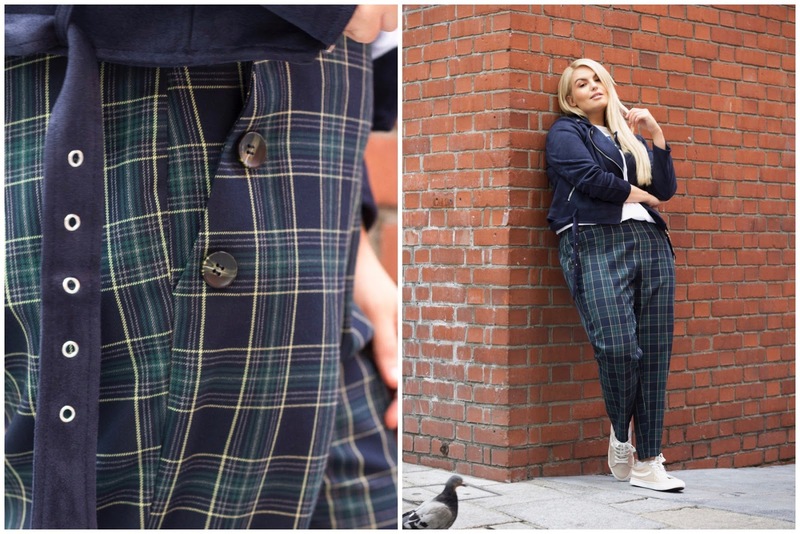 While we have seen this lovable print as a favourite during the Autumn / Winter months in skirts to coats, the return of the tartan print trouser itself is a huge catwalk trend for 2018. It's already a huge celeb favourite with the likes of Olivia Palermo to Bella Hadid and Emily Ratajkowski already sporting this trouser style. When it comes to print heavy pieces like this, opting for more of a cigarette cut trouser works on a multitude of body types while giving you options to wear them with various lengths in tops; be it peplum cuts, longer lined tops, a crisp white shirt, or go for a 90's grunge feel and pair it with a biker jacket either leather or as seen today in a suedette find. While today I've shown the more casual side, these trousers can be glammed up quite easily: top ideas as mentioned above or look to a plain round neck top, statement necklace and killer heels, go matchy-matchy with a tartan top, or play with cuts and texture opting for a chic bardot cut off the shoulder navy or black jumper. 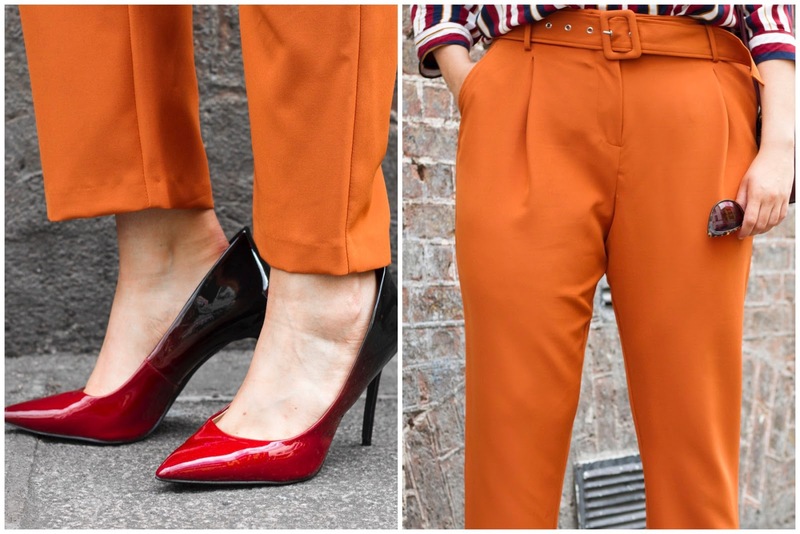 Wide leg trousers are one of my favourite styles and I'm thrilled to see more options for A/W particularly in the print stakes. 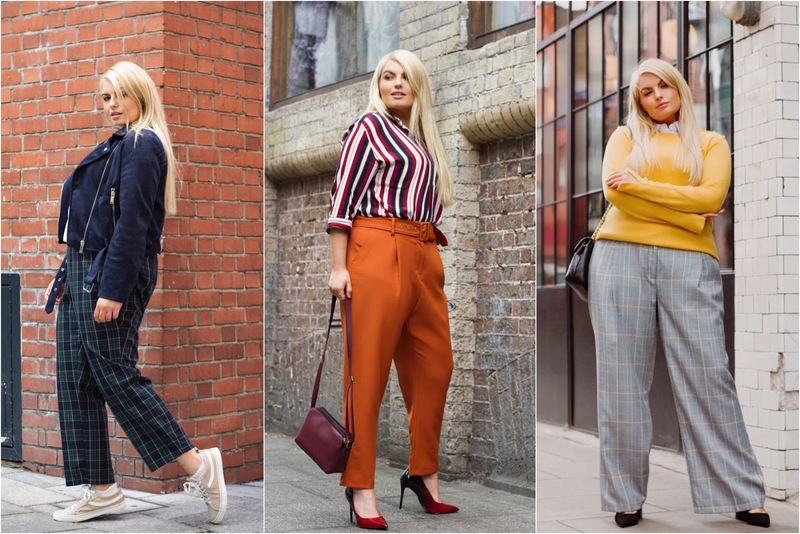 Workwear is something I am always asked about for curvy frames and these kind of trouser would work as a statement piece in your work wardrobe. 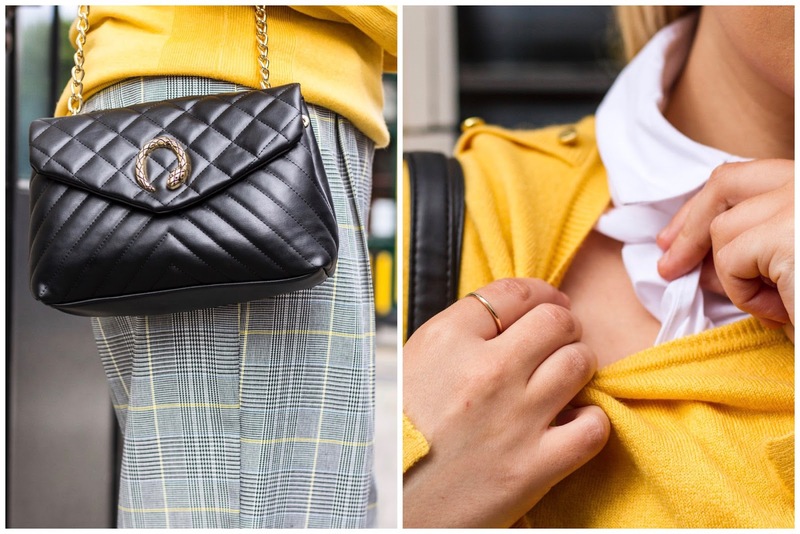 I've teamed them today with a pop of colour with this soft yellow jumper and while I was shopping in Primark for this collabouration I came across something extra I just had to sneak into this post! The shirt collar effect ( not a full shirt! ), was really popular last year and they are just so practical to have especially for workwear. You simply add them under anything with a round neckline or a small V neckline. It works with dresses, tops and jumpers and essentially gives you the illusion that you are wearing a shirt! It's ideal for those who want a smart effect to their outfit but don't want to have to worry about a) adding an entire another layer of clothing underneath or b) That you're outfit might not sit right / having to tug at it all day to sit correctly with a shirt underneath. Anyway back to these fabulous trousers! How to style? Embrace other colours from bold reds, cobalt blue even burgundy and wine shades. This can be anything from tops to jumpers to blazers. You can easily dress these down with trainers if you wanted to step away from the workwear vibe and don't be afraid to play around with accessories either. New season A/W Primark bags / Above an example of the shirt collars you can add under items to create the illusion of a shirt. All items are new season from Primark Autumn Winter 2018 all in stores at the moment. Full price details below also. 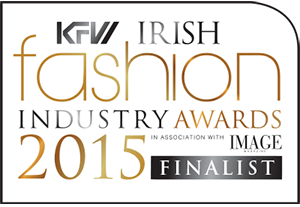 Note: I'm wearing size 18 in all items and size Large in t-shirt/ jumper. You can wear anything! The tartan look is my favourite! Good writing...keep posting dear friend and also you can visit https://www.nexter.org here for the more information about news !!! You look fab in all the dresses. All trousers/pants picks are colorful. I was wondering if you mistakenly missed black pants for curvy girls?